I LOVE our garden and the large window that is near the kids' play area in our Family Room - with my hummingbird feeders and butterfly flowers (yes, they have plants that draw butterflies and are pretty!!) we are blessed to see the most lovely scenes! With the amazing girls from Trinity homeschool, we careated these cards for the Soldiers Serving Abroad! 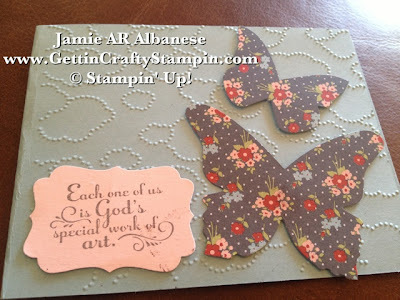 Here with Twitterpated Designer Series Paper, the amazing Big Shot, Cloudy Day Textured Impressions embossing Folder (from the Spring Mini), Baja Breeze and Pretty In Pink card stock, Decorative Lable Punch, and Blessings from Heaven greetings/sentiment stamp set these sweet cards are a great gift for any soldier to use to send home for their loved ones! 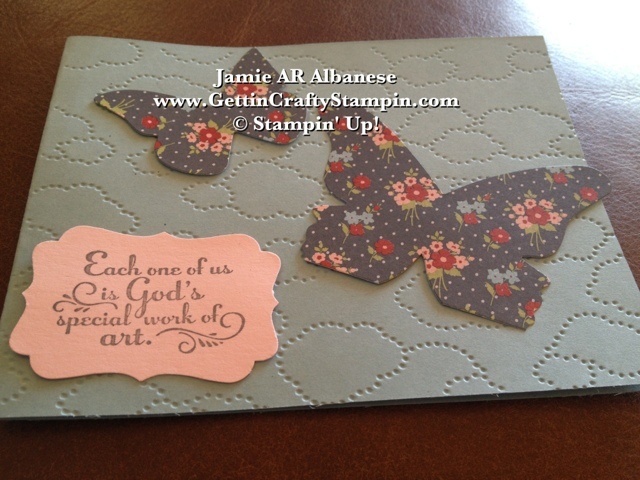 Stampin' Dimensional adhesive raises the butterflies and sentiment but also serve to hold onto the textured background - where other adhesives may struggle. 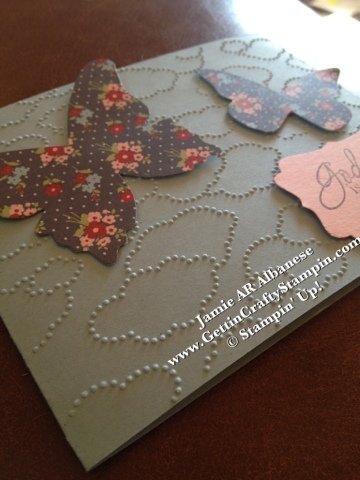 Layering the Designer Series Paper is great - with the two different patterns, yet the color coordination, it's a great way to be trendy (mixing patterns), but look stylish and not garrish! 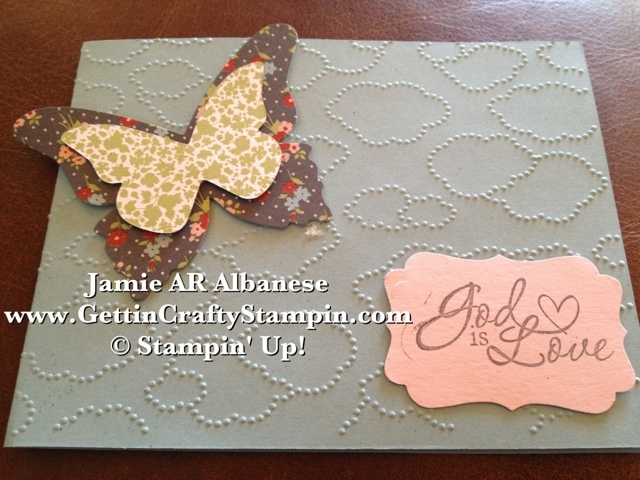 The Grey Ink stands up well on the Pretty In Pink paper! DeBossing is a fun trend, it's where the texture is pushed into the card like the one here.. it's a sweet and cool way to change up a card! 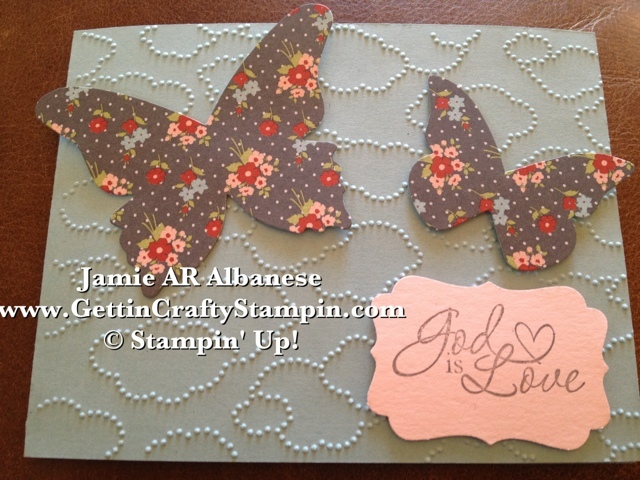 These clouds are a sweet texture to add to this fun card! How can YOU Support our Soldiers who are serving abroad? Play with the Big Shot, you can not go wrong with this tool! I love that it's for sale, 24/7/365 on my website but, too, that it's 1/2 off with a qualifying Workshop/Private Class! (I have two - lol - even considering a third - lol).